Well, technically I’m the stranger. It’s almost as if I dropped off the face of the blog-world. You probably thought I forgot about you, that I gave up on sugar and baking, and that I’ve turned the other cheek. I assure you, I haven’t. Life happened and in the midst of everything, I needed a hiatus. That hiatus turned to laziness then a loss of motivation. I think I’m ready to give it another go, I hope you’ll still have me. 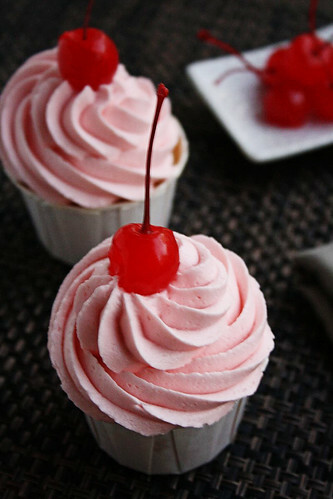 After all, I made you cupcakes. These bad boys are SO tasty. 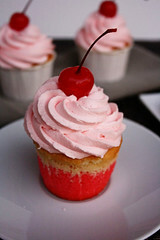 A fluffy vanilla infused cake base with a cherry base, frosted with cherry infused buttercream and topped with a cherry. So what do you say? Friends again? Pretty please with a cherry on top? 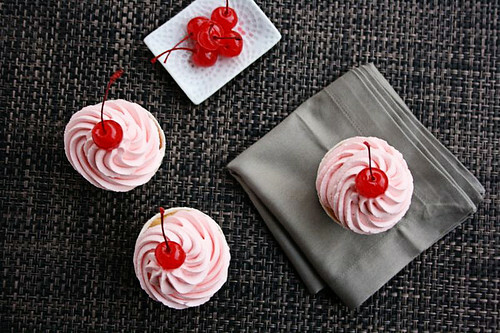 To make the cupcakes: Preheat the oven to 350 degrees, and prepare a cupcake pan with your desired paper liners, set aside. In a medium bowl, whisk together 1 and 1/2 cups of flour, baking powder, and salt. Set aside. 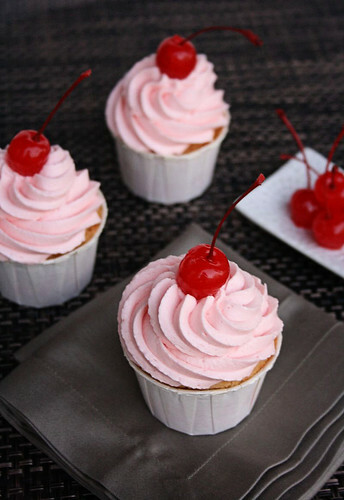 Place about 3/4 cup of the cupcake batter in a separate small bowl and add the remaining 1 tablespoon of flour, maraschino cherry juice, and red food coloring (to your desired tint). Evenly distribute the red cupcake batter among your prepared liners, about 1-2 teaspoons per liner, gently smoothing out the batter. 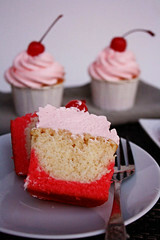 Once the red batter is in place, evenly distribute the remaining cupcake batter among the cupcake liners, making sure not to mix the two batters. Be sure to cover the red batter completely so it doesn’t bake up the sides and to the top. 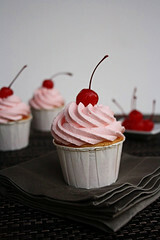 Pipe as desired onto your cooled cupcakes and garnish with a maraschino cherry. Enjoy! Recipe from The Curvy Carrot For a gluten-free version go to Simply Gluten-Free for the recipe. Today’s TWD post is supposed to be a delicious looking fig cake (head on over to Ursula of Cookie Rookie’s blog for the recipe). I have figs. But I chose to save them for something else as you won’t find figs running rampant around here, so when I saw two packs of great looking mission figs, I nabbed them with a different project in mind. 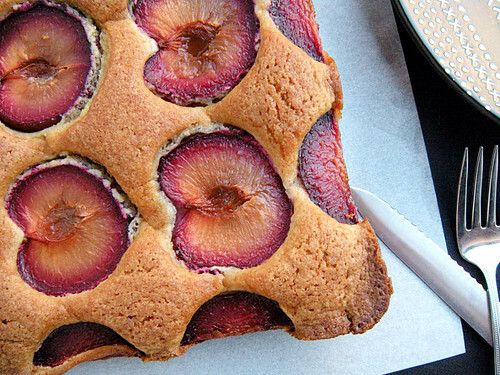 I’ll get to this cake eventually, but for right now please accept this equally delicious plum cake. 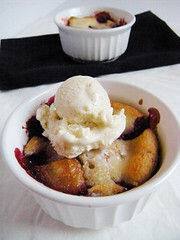 Serve it warm, loaded up with some vanilla ice cream or cinnamon-infused whipped cream for a wonderful Autumn dessert. Center a rack in the oven and preheat the oven to 350 degress F. Butter an 8-inch square baking pan, dust the inside with flour, tap out the excess and put the pan on a baking sheet. Whisk the flour, baking powder, salt and cardamom, if you’re using it, together. Working with a stand mixer, preferably fitted with a paddle attachment, or with a hand mixer in a large bowl, beat the butter at medium speed until soft and creamy, about 3 minutes. Add the sugar and beat for another 2 minutes. Add the eggs one at a time, beating for a minute after each addition. On medium speed, beat in the oil, orange zest and vanilla. The batter will look very light and smooth, almost satiny. Reduce the mixer speed to low and add the dry ingredients, mixing only until they are incorporated. Run a spatula around the bowl and under the batter, just to make sure there are no dry spots, then scrape the batter into the pan and smooth the top. 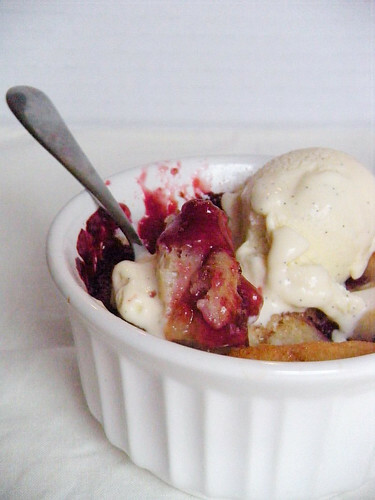 Arrange the plums cut side up in the batter – I usually make 4 rows of 4 plum halves each – jiggling the plums a tad just so they settle comfortably into the batter. 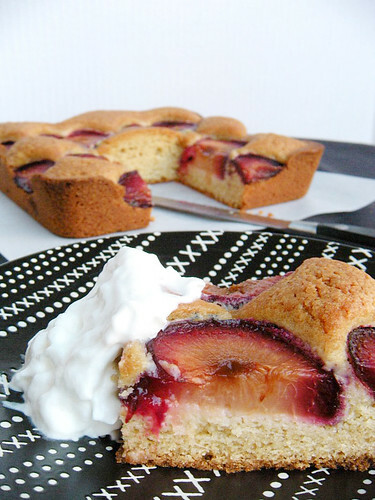 Bake for about 40 minutes, or until the top is honey brown and puffed around the plums and a thin knife inserted into the center of the cake comes out clean. 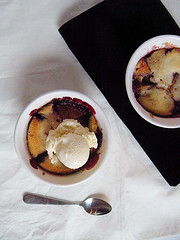 Transfer the cake to a rack and cool for 15 minutes – during which time the plums’ juice will return to the fruit – then run a knife around the sides of the pan and unmold the cake. Invert and cool right side up. As I’m sure I’ve said a billion and one times, I’m from Houston. And here in Houston, there really isn’t such a thing as Autumn. In my opinion, 80-something degree weather isn’t reminiscent of Fall. But this isn’t me complaining (…yet, give me a few more weeks) but rather relishing in these last few weeks of warm weather. The last few weeks of shimmering, golden sunlight gently falling on your sleepy face, peeking through that tiny slit in your curtains that, if it were not for the sun, you’d never notice. The last opportunities to walk around the flea markets hand-in-hand with your husband as you point out all the fluffy, adorable puppies that you demand he buy you, but he never does. The last chances to simply stand outside, stretch and breathe in deeply, inhale the warmth of the sunlight. The last moments to enjoy wearing your favorite feminine, flowy, flowery (alliteration!) tank top before you sadly (and begrudgingly) have to banish it for a few months. 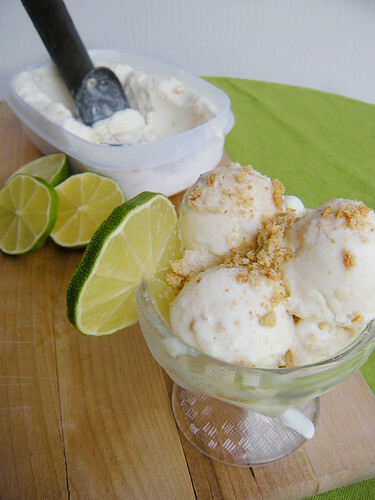 And the last few excuses you have to make delicious, creamy ice cream that reminds you of far away islands. 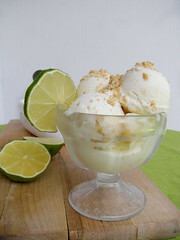 *Note: I used fresh squeezed lime juice but the original recipe states that bottled lime juice can be used. Just be sure that it is as fresh as possible. 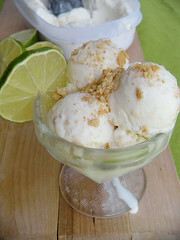 In a large bowl, combine milk, lime juice, heavy cream, salt and sweetened condensed milk; whisk to combine. 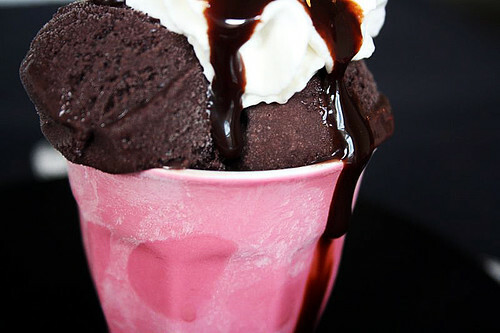 Pour mixture into your ice cream maker, and freeze according to manufacturer’s instructions. I used my Kitchenaid Ice Cream Maker Attachment and let it run for the suggested 25 minutes and my ice cream was not what you would consider soft serve, so I let it run for another 10 minutes until it became more solid. 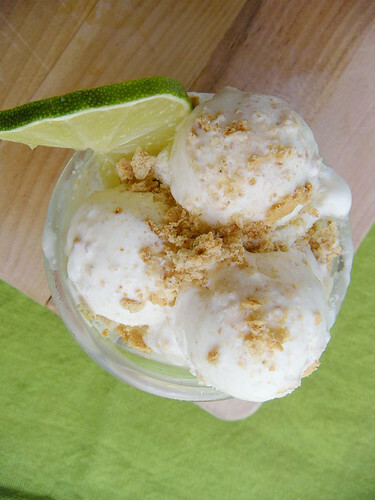 Stir in the crushed graham crackers into ice cream. 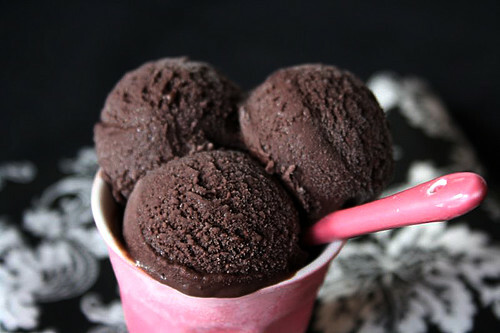 Spoon ice cream into a freezer-safe container, and cover and freeze for 1 hour or until firm. Sprinkle each serving with 1 teaspoon graham crackers. 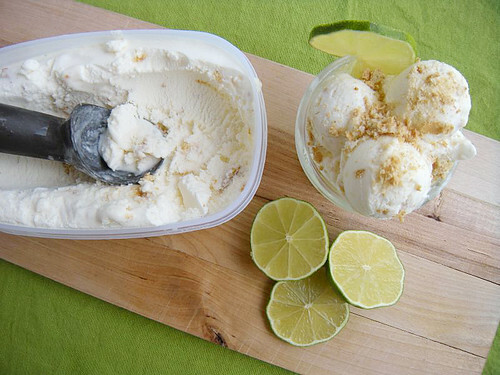 Garnish with lime wedges or lime zest if you wish. Ahhhh, who am I kidding? 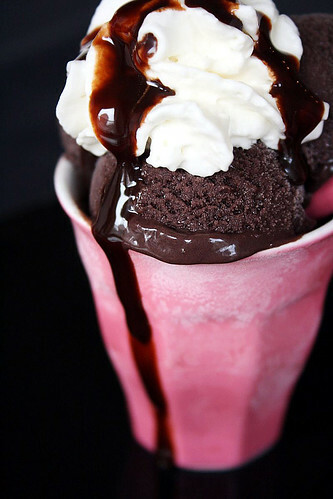 I love ice cream so much that I’m sure I’ll post more in the Winter months. 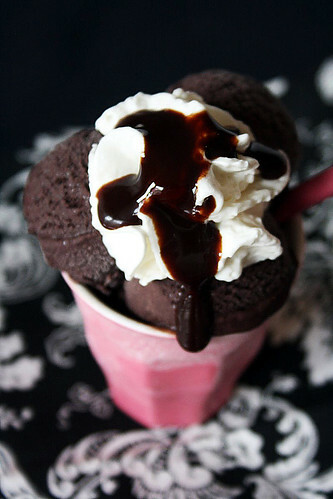 After all, I am the loon who drinks hot cocoa and eats chili in the Summer and craves ice cream in the Winter. 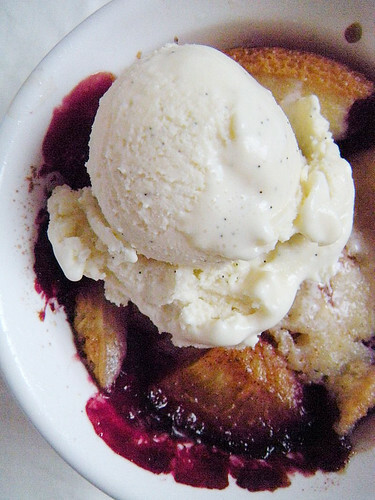 Plums are pretty much my mommy’s favorite fruit ever. She loves them all: sweet, sour, black, red, overripe, fresh, baked, dried, juiced… you name it. 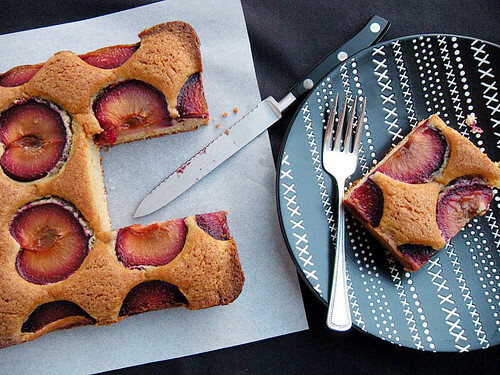 So I jumped at the chance to invite her over when I was making these and as soon as I said the magic words (plum cake, duh) she came right over. She says she came for the company but I think she secretly came for the cake 😉 She walked in and could smell the plums mingling with the cake and cinnamon and she was eager to try some! Which is rare as my mom isn’t really one for a lot of sugary baked sweets. Lucky for her, I scaled back the recipe (I quartered it and it was perfect for 3 ramekins) which meant that it was in and out of the oven in no time. Topping it with some homemade vanilla ice cream (recipe coming soon, promise) guaranteed that this dessert wouldn’t last long. And that held true. She inhaled it and loved every delicious, warm bite. Old me: fruit in salad? Weird. Put plate away. New me: fruit is salad?! GIMMEEEEE!!!! I’m reformed, I must admit. Up until a few years ago, fruit in a salad was unheard of to me. I liked salad. But salad = vegetables. Period. Nothing fishy here folks. But one day I woke up and decided that I liked fruit better than I liked veggies and I was bored of the saaaaame old boring salads: lettuce, tomatoes, cucumbers, carrots, onions, avocado and dressing. Bo-ring. So I was at a restaurant that rhymes with schmilis, and tried a salad with pineapples, mandarin oranges and blueberries and I swear if the floor wasn’t slightly sticky and there wouldn’t have been a baby crying behind me, I would have mistaken this booth for heaven. 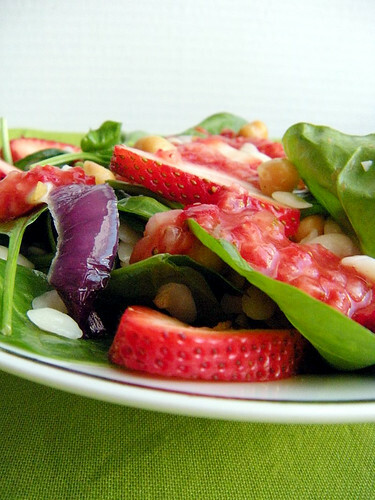 One day, I will re-create this salad. But until then, I wanted to experiment with what I had on hand. 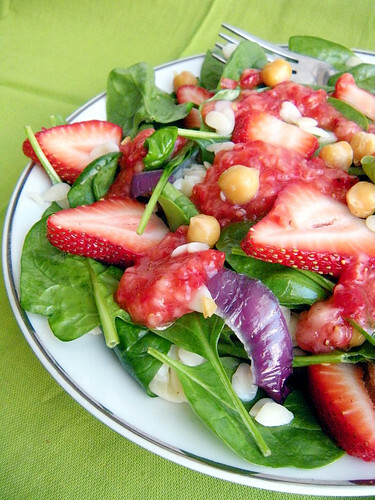 And that was sweet, sweet strawberries and spinach. This salad comes together quickly. The most work you’ll do is cooking the orzo, and that’s about as simple as cookie noodles. Scout’s honor. So get to it folks. Don’t wait two decades until you try fruit in your salad. In a medium pot, boil water for orzo and cook according to directions. Drain and set aside until ready to use. Heat a large skillet over medium heat and add a splash of olive oil. Add sliced red onion and chickpeas to the skillet with a sprinkle of salt and stir to coat. Saute until onions are soft, about 10 minutes. Add in garlic and cook for 3 minutes until aromatic. Turn off heat and toss in spinach. Allow residual heat to slightly wilt the spinach and remove from heat. (Alternatively you can choose to wilt the spinach completely, in which case leave it over the heat until wilted OR toss everything together with fresh spinach and eat is raw, delicious either way.) Add in strawberries and orzo and mix to coat. Season with salt and pepper. Place in a beautiful big bowl. 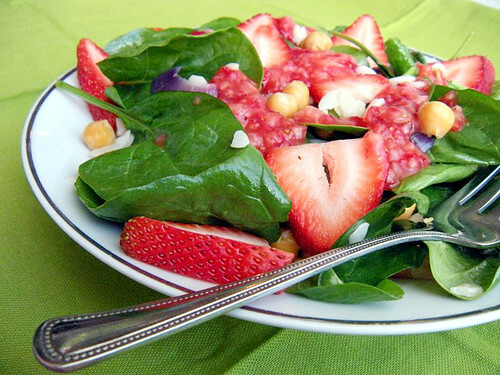 To make the dressing: toss strawberries, club soda and sugar in a food processor and pulse until liquefied. Drizzle over your salad (and toss to coat if you like). Serve immediately. It tastes good cold too! My mommy likes biscotti. And I like my mommy. I want her to be happy. 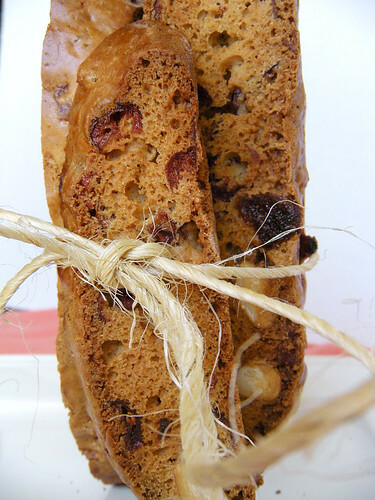 So I wanted to make her yummy fruit studded biscotti since they are her favorite. But dang I didn’t plan for this. The dough was sticky and difficult to work with. I pulled the log of biscotti out too soon so the center was still a bit raw. Then, without thinking, I placed the baking sheet on a hot burner and it burned a few of the best looking biscotti. And even after 10 mins of extra oven time, they came out still slightly soft. It didn’t seem to be coming together. 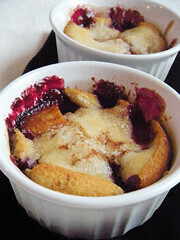 I’m still not completely sure that I should share this recipe with all it’s hiccups, but the end result was tasty. Regardless of the mini-stroke that I incurred trying to make these. Below is my adaptation of the recipe. It originally called for 1 less cup of flour but that left the dough pretty soupy. My only advice it to have a bowl of flour next to your work surface and flour the heck out of your counter and hands while working with the dough. Soak cranberries in boiling water to cover in a small bowl until softened, about 10 minutes. Drain, then pat them dry with a paper towel. Put a rack in the middle of oven and preheat oven to 325 degrees F. Line a large baking sheet with parchment paper and set aside. In the bowl of a stand mixer (or a large bowl), whisk flour, sugar, baking soda, baking powder and salt until combined. Add eggs, vanilla and honey and with your stand mixer, mix (or with an electric mixer) at medium speed until dough forms. Add cranberries, apricots and pistachios and mix at low speed until combined. Turn dough out onto a WELL-floured surface and knead a few times. The dough will still be QUITE sticky! Halve dough. Using floured hands, form each half into a slightly flattened 13-by-2-inch log on baking sheet, spacing logs about 3 inches apart. (Making two loaves was quite a task so I just made one large log instead) Brush logs with egg wash. Transfer logs to a cutting board. With a serrated knife, cut diagonally into 1/2-inch thick slices. Arrange slices, cut side down in one layer on a baking sheet (it’s fine if slices touch each other). Bake, turning once, until golden and crisp, 20-25 minutes. 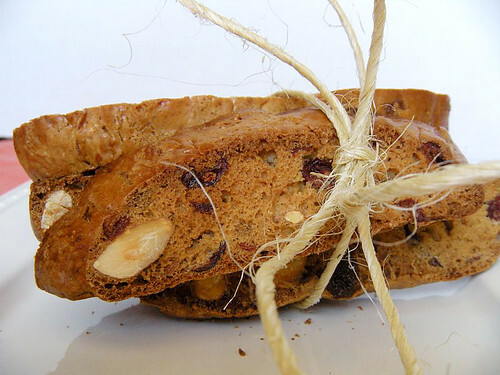 Transfer biscotti to racks to cool. Optional: melt a bit of white chocolate and drizzle onto the cooled biscotti and allow to harden.